Compared to standard 4.0Ah packs, the BAT622 offers up to 45% more runtime. More runtime means more time using your tool before it needs recharging, and this is why a 6.0Ah battery is such a big deal. Only a couple of years ago batteries seemed to be stuck at 3.0Ah. 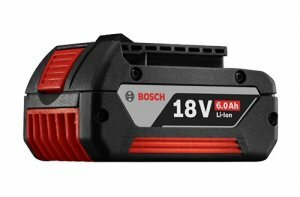 Like previous Bosch batteries, the BAT622 incorporates Bosch’s CoolPack heat conductive housing, which is designed to keep the battery running cool. Heat kills batteries, but CoolPack batteries are said to extend recharge-life up to 100x longer than packs without the feature. Bosch BAT622 batteries also feature a built-in fuel gauge and an electronic monitoring system that further extends battery life and runtime by optimizing voltage output, and monitoring heat. The new 6.0Ah batteries maintain the same weight and size as previous FatPack batteries, though the overall charge time will increase. So even though the suggested retail price is the same as the 5.0Ah was, at $129, do you want to wait for a longer charge time?